This short 21 page ebook is designed to give you an understanding of what the idea of the Hammar Axis is and why it is important to understand this new idea. The basic premise of the Hammar Axis idea is that a wobbling Earth’s Axis is NOT the cause of the precession of the stars as has been the considered and accepted reason for almost 500 years. The idea makes the observation that orbital planes of bodies in space remain close to constant unless interfered with by another force or body. The orbit of the Moon around the Earth, the orbit of the Earth around the Sun and introducing a previously unconsidered rotation, the orbit of the Sun around the Hammar Axis, the central axis of our galactic arm. Then there is the rotation of the Galaxy itself, estimated to take anywhere between 200 million to 250 million years and more recently calculated to 226 million. The Hammar Axis idea proposes that apart from any adjustments caused by internal or external forces the tilt of the Earth’s axis remains close to constant in relation to the plane of the Earth’s orbit of the Sun. Taking the rotation of the galactic arm into account explains how our view of the stars during this time appears to change in what we know as the precession of the stars. 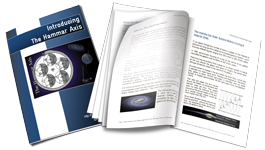 All the main points and subjects that support the idea of the Hammar Axis are covered in this introduction to the Hammar Axis ebook. The ebook also includes references to allow you to research any concept or subject further. Your privacy is very seriously respected and we will not ever provide another party with your details. 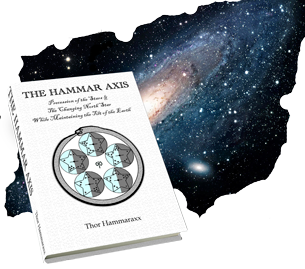 Of course, you can buy the Hammar Axis book for even more detail about the theory and it’s origins. Complete the form below for your FREE copy.